Wow - what a few weeks it has been. Some weeks are just like that, aren't they? This week, we had a photo crew here for an upcoming feature next year in Country Home Magazine. We shot for two days - moving furniture around, me frantically cleaning where it hadn't been cleaned in years and would show in a photo. Days like these are long and very physical and intellectual all at the same time. I love them but I am always glad when they are over. I worry, worry, worry before but know deep inside it will all work out fine. Once the shoot is over, I collapse. The house is destroyed pretty much and it takes months to find everything again. I always wonder why I say yes but then as the producer who came said when I said "never again" that I will forget all the work and do it again perhaps. Above is a look behind the scenes. Just so you know, in every photo shoot I have been involved in, there is shear chaos just set outside the camera lens' reach. Piles of stuff which doesn't look good. The regular stuff of life - piles of paper, batteries, brooms, vacuums, unattractive packaged objects, hammers, nails, tape..... As each room is finished with its close-up, the mess gets shifted again. By the time the shoot is over, it looks like a bomb went off. Good thing my family doesn't mind and is kind of used to what ensues. The cool thing about CH coming is that they were here in 2003 for a feature that came out in 2004. You can read that article on my website here. I was surprised that they would want to come back and feature our house again but it has been over a decade and most likely they have new readers - and different readers. And evidently the article back then was very popular. It was fun for me to revisit the photos from back then and see how things in our house had changed - and they have even though I thought they hadn't. 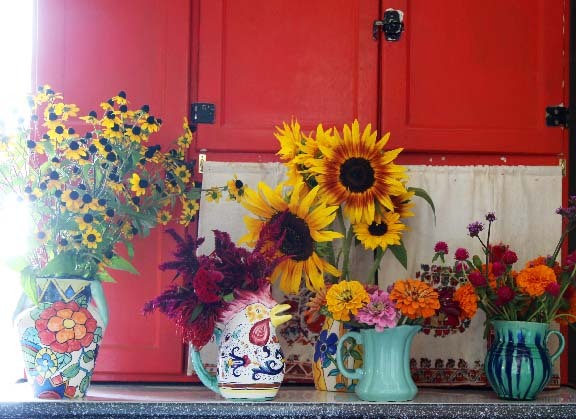 When I do these shoots, my favorite part is arranging the flowers in all my different vases. I had tons of sunflowers to pick - after they photographed them. Since they wanted to photograph my cutting garden, I didn't want to pick it because my zinnias are a bit scarce. Luckily I have flower growing farmer friends. On Monday, when I should have been cleaning, off I went to see Olivia and Susie at Wingate Farm just over the MA line in NH. Olivia let me pick her garden and gave me left overs from the Saturday farmers market. Thank you Olivia! Here are some of the bouquets I made from their flowers and mine. 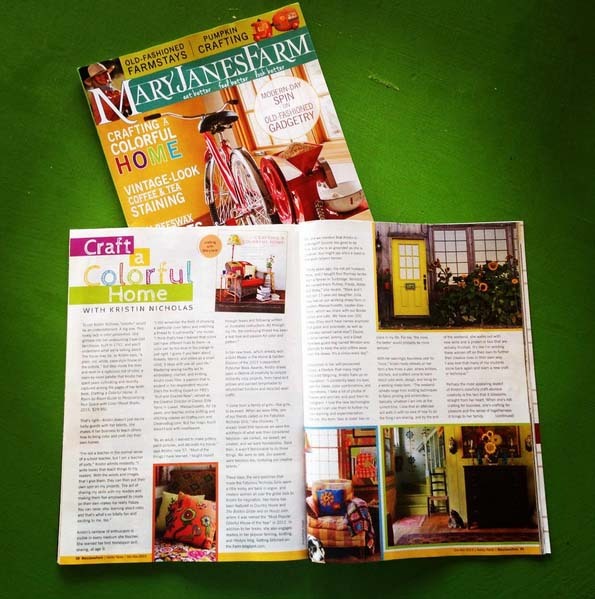 In other news, I'm so excited to share that there is a new article about my work and my new book Crafting A Colorful Home in the Oct/Nov issue of Mary Jane's Farm Magazine. Four pages full of photos and a nice interview. So awesome to be introduced to a new group of readers. Thanks to Carol Hill at MJF for pulling it all together. If you don't know Mary Jane's Farm, you can go to their website here and learn more about their magazine, their products, and the dynamic people behind the brand. Mary Jane Butters writes a great blog too! The kittens are starting to leave the nest. I have homes for 3 of the 4. 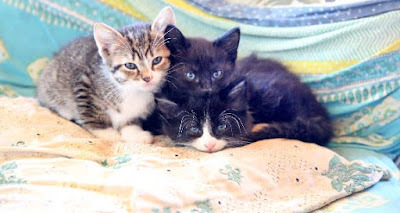 If you know of anyone who might like a good farm cat, the gray tabby with the white markings in the photo below is still available. Shoot me an email at kristinnicholasATgmailDOTcom. I have one free weekend beginning tonight! Yippee! 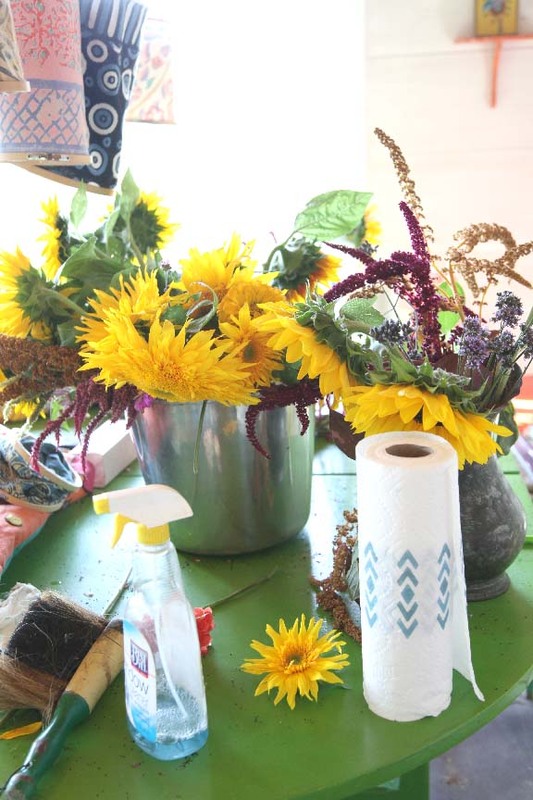 And then my last Getting Stitched on the Farm creative retreat of the 2015 happens next weekend September 26/27. I still have spaces available - it is the only knitting retreat of the year. If you are interested in a last minute great time, check it out here. *WHEW*! - okay, now, take a big breath - for both of us! I've got a Fall Craft Show on Sunday and going nuts here trying to "prep" stuff! And, it doesn't help that we recently purchased a SMALLER car that I now have to origami-"RUBIK"! Meanwhile, *MAYBE* the temps will be dropping slightly that day..? Trying to push WOOLLY stuff on People when the temps are 75+ will be a tough "sell"! Anyhow, looking forward to when the Feature comes out! !